A coastal East Midlands county crammed with pretty waterways, quaint villages and traditional seaside resorts, Lincolnshire is criminally underrated. The birthplace of Sir Isaac Newton and Lady Margaret Thatcher has borne witness to some of England’s most important historical events, many of which can be discovered in Lincoln’s magnificent castle, cathedral and country manors. Built by William the Conqueror in 1068, Lincoln Castle is one of the oldest Norman castles in the UK. 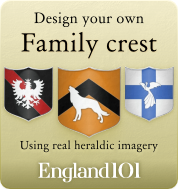 From medieval towers and dungeons to a Victorian prison, this castle’s walls are steeped in history. The best bit? It’s is the only place in the world that exhibits an original 1215 Magna Carta alongside the subsequent 1217 Charter of the Forest – two documents which led the way to modern democracy and greatly influenced the US Constitution. Next door you’ll find Lincoln Cathedral – an impressive example of English Gothic architecture that was once the tallest structure in the world. Tour the tower and rooftop for sweeping views of the Lincolnshire countryside, and keep an eye out for the Lincolnshire Explorers Window featuring Captain John Smith, who helped establish the first Jamestown Colony and was allegedly saved from execution by Pocahontas. He was born and raised in the Lincolnshire village of Willoughby and christened in St Helena’s Church, which commemorates Smith and the Jamestown story in stained glass. More Americana awaits in the cathedral’s Medieval Library, where you’ll find a copy of the first American bible, translated into Native American Algonquin in 1663 by John Elliot, as well as an image of John Smith smoking a pipe with Powhatan (Pocahontas’s father) and a rare edition of his Sea Grammar. Don’t miss a walk around the beautiful cloisters, which you may recognise from The Da Vinci Code. Boston – the distant cousin of Massachusetts’ capital – is a small market town with fascinating Mayflower connections. Many pilgrims originated from Lincolnshire and neighbouring Nottinghamshire, and before they could set sail they were imprisoned for a time in the 14th century Guildhall. Visitors can see the cells for themselves, as well as a restored 16th-century courtroom. St Botolph’s Church, otherwise known as ‘The Stump’ was once led by vicar John Cotton, who called for reform within the church. Many of his supporters left for the New World, including the great-grandfather of Founding Father and 2nd US president John Adams. Eventually Cotton and his wife followed suit, and he became an important figure in the Massachusetts Bay Colony. Lincolnshire boasts a number of beautiful heritage properties. Burghley House has an incredible collection of Italian Old Masters, which hang in splendidly opulent Elizabethan and Baroque staterooms. Understated National Trust property Woolsthorpe Manor was the birthplace of Sir Isaac Newton – the famed apple tree still stands in the grounds of the preserved 17th-century farmhouse. Gainsborough Old Hall is an astonishingly well-preserved manor which has welcomed many esteemed guests over the centuries, including Richard III, Henry VIII and Methodist preacher John Wesley, who was born and raised in nearby Epworth. John Smyth also held sermons here, inspiring many followers to join the Mayflower voyage. 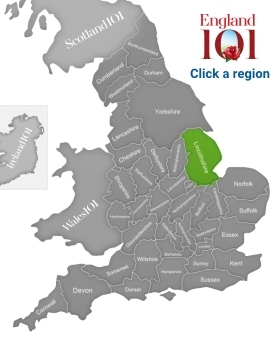 Nicknamed ‘Bomber County’, Lincolnshire has strong ties to wartime aviation, with multiple museums dedicated to educating visitors about WWII aircraft, in particular the Lancaster Bomber, which was manufactured locally. See a vast collection of WWII memorabilia at Lincolnshire Aviation Heritage Centre in East Kirby; visit a moving memorial at Lincoln’s International Bomber Command Centre; and watch a Bomber take flight at the Battle of Britain Memorial Flight Visitor Centre in Coningsby. Lincolnshire is home to some surprising wildlife; spot migratory seabirds along the coast at the North Sea Observatory, or, in winter, find frolicking seals at the Donna Nook National Nature Reserve. The county is also dotted with windmills – Heckington Windmill is the only tower windmill in the UK with its eight sails still in tact, while 100ft Moulton Windmill claims to be the tallest. Many mills welcome guests and often provide refreshments in quaint tearooms. Book a table at The Bronze Pig to sample exceptional British-Mediterranean cuisine and savvy wine pairings; or experience fine dining in one of Lincoln’s oldest buildings, The Jews House, which dates back to around 1150. Alternatively, Brown’s Pie Shop serves up hearty pot pies and comforting classics. For lighter bites, try a panini or a piece of cake at Langton’s Café in Lincoln Castle. Beer fanatics will enjoy a tour of Bateman’s Brewery followed by a pint in the riverside beer garden. 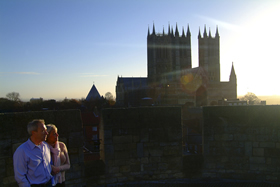 A mature couple enjoying the view and sunset from the walls of Lincoln Castle. Lincoln Cathedral is in the background. 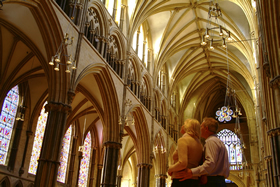 A mature couple, stood arm in arm, admiring the spectacular interior of Lincoln Cathedral. 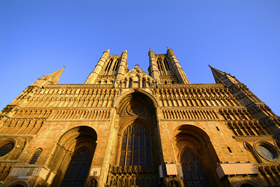 Lincoln Cathedral is one of the finest medieval buildings in Europe. 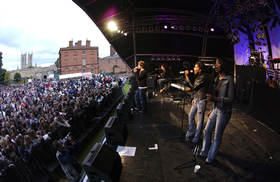 An artist performs at the Midsummer Magic Tour at Lincoln Castle, Lincoln, Lincolnshire, England. Lincoln Cathedral is one of the finest medieval buildings in Europe, which towers above Lincoln, a prominent landmark for miles around. Steep Hill in Lincoln. 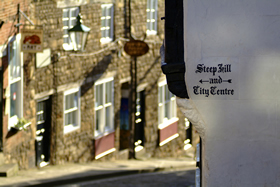 Steep Hill is, as the name implies, a hill which requires a certain level of fitness to ascend! 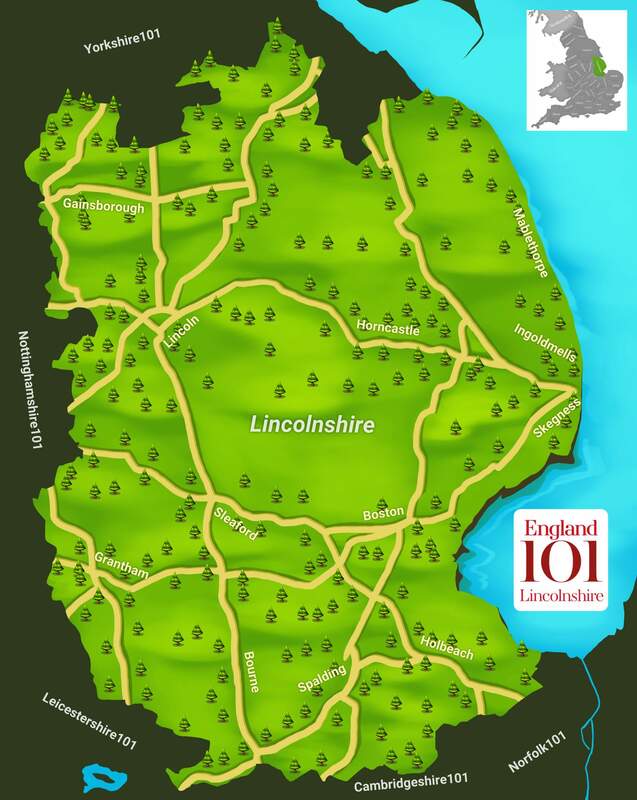 How much do you know about Lincolnshire ?